Cinabre is a perfume by Maria Candida Gentile for women and was released in 2009. The scent is spicy-floral. It is still in production. Never would I have imagined that ginger, pink pepper and black pepper could smell like this, but let your mind put them together, assume success, and Cinabre's top note is exactly what you'll get. The rose heart rises and blends with the spice, neither overpowering the other. Next comes the vanilla base and the sweetly resinous opoponax and this scent's magic is achieved. If you don't like pepper, this one may not be for you, but give it a try. 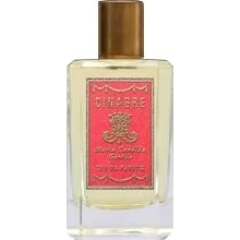 Like most Maria Gentiles, Cinabre is a special and exotic perfume, well worth the experience.